They did indeed. :) I got one of the original pink Caboodles as a birthday gift in 1987 and was still using it in college. No better solution when you have to carry all your makeup around. I'm famous for going into Home Depot and asking where to locate XYZ object by describing the object, as I never know what it's actually called. I am then asked "What is it used for?" Hell, I don't know. I can tell you what I plan to use it for... jerryrigging something together. Intended purpose? Not a clue. I like the idea to sort the shoes, I think I'm going to copy it. I'm slightly obsessed with organization. :) I especially like systems that allow you to see many options at once, like the ice cube trays. I also use some old bottles for my beads, and sometimes empity C-vitamin boxes for my half-finished jewels and the components I want to use also. But these ice trays really inspired me :) ! Yes, bottles and jars are great because you can easily see what's inside. Spice racks with their multitude of little jars are perfect for beads and jewelry bits. The mesh tray idea is excellent! I might try that myself, as my collection of spider earrings is getting slightly out of control. Whenever my hubby goes to a thrift store or flea market, he picks up cigar boxes, which I then stuff with sewing supplies. Mmmm... boxes. :D I love boxes. I can't resist when I find them at thrift stores. I have more decorated boxes than I have stuff to put in them. Oh, no, don't feel stupid. :( With automatic ice makers almost ubiquitous now, ice cube trays aren't exactly top of mind for most people. I have a trouser/pant hanger which should hold four pairs, instead I have it holding all my neck scarfs, I can get several on one poll, all neatly in my wardrobe! Good solution! Scarfs and belts can be difficult to organize. Great ideas! I have a beautiful old black metal trunk, which in the last century was used for storing blankets... it now holds my enormous artificial Xmas tree 11 months of the year! I love old or antique-style trunks. They are super useful and have a lot more personality than a cardboard box. I use old makeup cases, like the ones you see durring the holidays filled with assorted makeup, to organize all my beads and other jewelery making components. 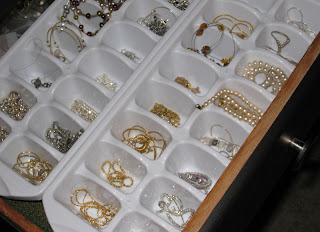 Great idea to use icecube trays, I've been looking for a new way to store my earings. I also have a "small table bin" wich was a cocoa powder can, before I've painted it black. I like the ice tray idea, too! I am LOVING some of these ideas. I have used ropes hung from the hanger-bar in my coat closet to store my ribbon spools, but that doesn't keep them *entirely* dust-free, and it also takes up valuable closet space. I have also used organza ribbon to store earrings, but then what to do with it? You can hang it in the closet, but then you have the same closet space issue. I wound up rolling the ribbons carefully in my jewelry box and then I forgot all about my rolled up earrings over time. I could easily see a row of mesh tray dividers on the wall at the back of my closet. Thanks for the great suggestion. Also, is that picture from Convergence 12 in New Orleans circa 2006? Thanks! I like having everything put away tidily, but that can make it easy to forget what you have. The ribbon box has worked well; I'm thinking about a small suitcase for my 50- and 100-yard spools of lace and trim, which are awkward to stack. The picture is indeed from C12. I once made my own shelf for my hoodoo occult oils -- I just stuck a bunch of cardboard boxes together then papier mache'd them. It was designed like a staircase, with the idea being that I would be able to read all the labels on the bottles and not have to pull things out. I also use old tea boxes with the lids cut off to store other oils. Ice cube trays are genius. I'm definitely doing that.